I love pig, so I was excited for the 46th episode of Good Eats. I think of ham as something to be consumed for special occasions or holidays. When your husband has cancer, you begin to view every day as a special occasion. So, a random August day seemed like the perfect occasion to prepare a ham. I love country hams. For several past holidays, my parents have ordered Waco hams. I relish their dry texture and excessive saltiness, leaving me with rings that fit too tightly on my water-retaining fingers. In the episode, Alton is able to easily find a country ham at his local grocery store, but this was not the case for me. A country ham, by the way, is a ham that is dry cured and hung to age. We ended up finding a smoked ham at a local butcher shop, which is not exactly the same thing as a country ham, but it was the best we could do. To make Alton’s country ham, you’ll need to prepare a couple of days in advance. To start, if your ham has a hock, you will want to cut it off. My ham did not have a hock. 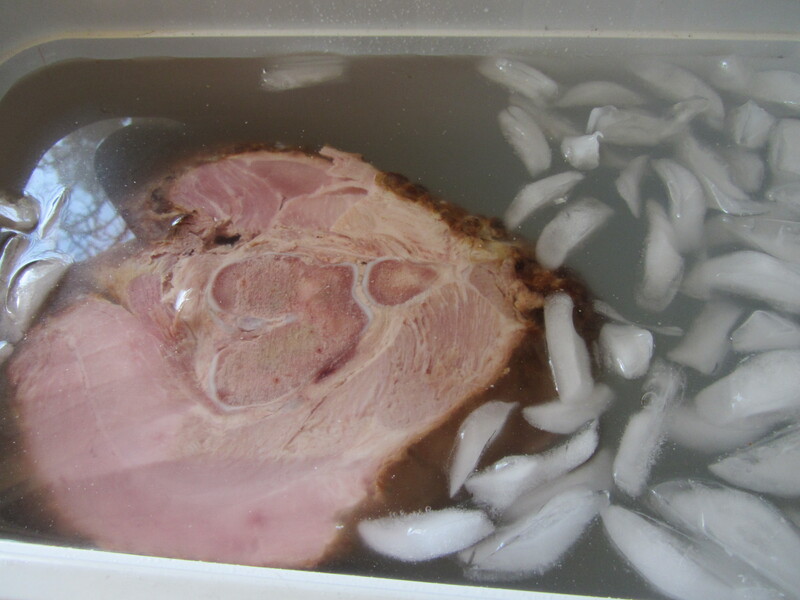 Stick your ham in a cooler, preferably with a drain, and submerge the ham in water. Your ham will soak for two days, and you will want to change the water twice each day.The purpose of the soak is to pull some of the salt out of the ham. I added some ice to my cooler since we had warm weather. Soaking the ham in a cooler. 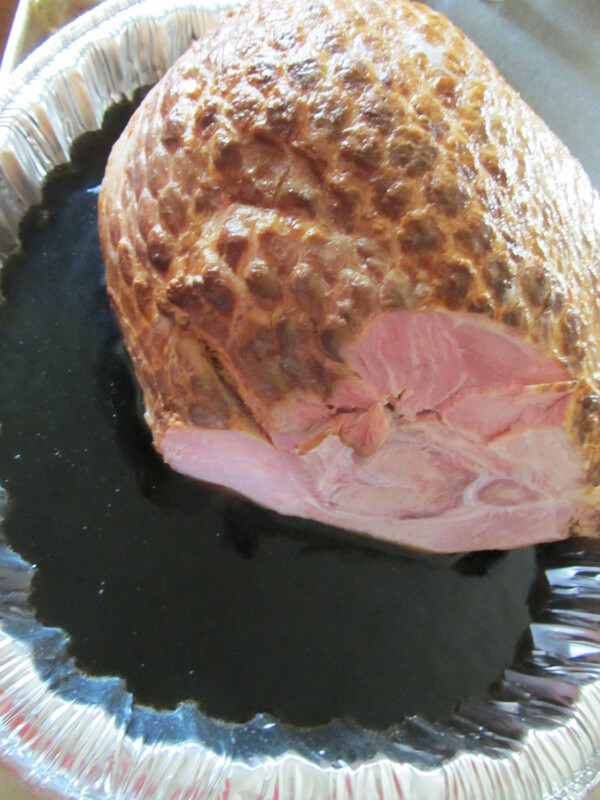 Once your two-day soak is done, stick your ham in a disposable roasting pan on a baking sheet. Fill the roasting pan with Dr. Pepper until the liquid comes 1/2 to 2/3 up the side of the pan. 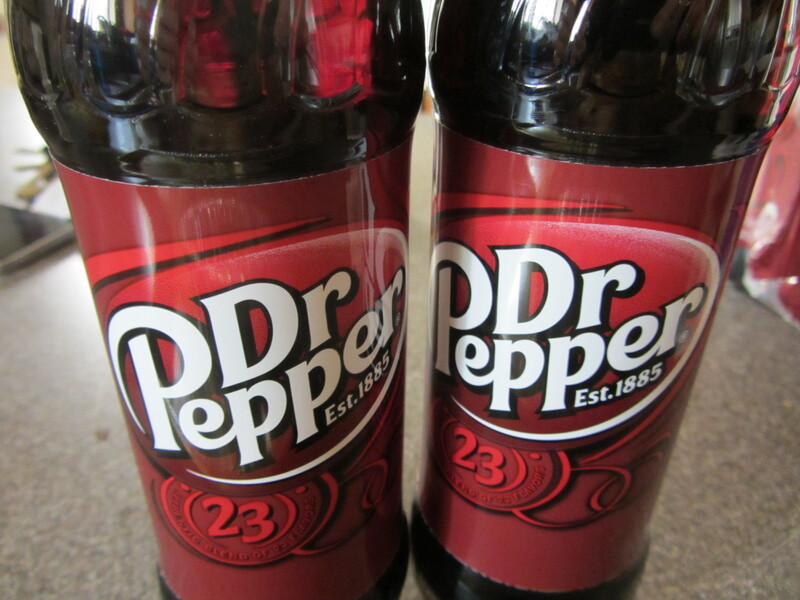 Alton said this would only require 3-4 cans of Dr. Pepper, but I needed five 16-ounce bottles to fill my pan. Roasting pan filled 1/2 to 2/3 full with Dr. Pepper. 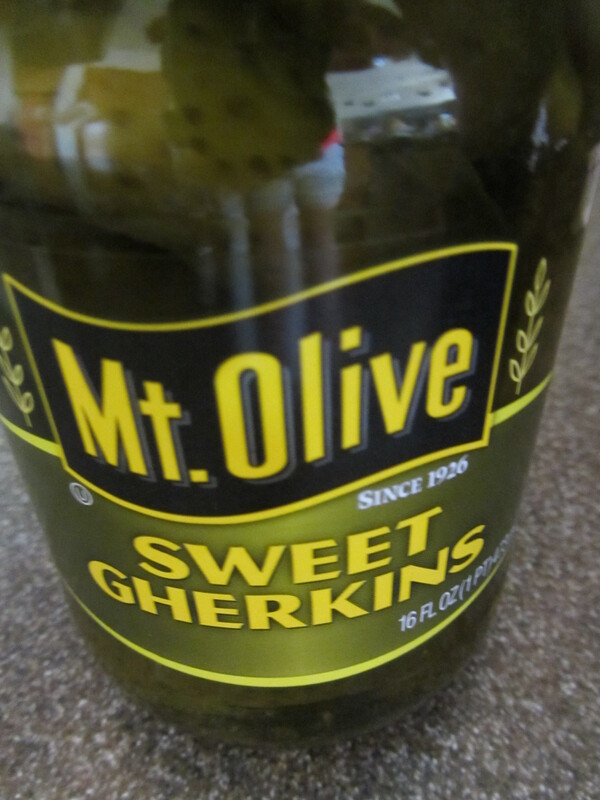 In addition, add some sweet pickle juice to the pan; the online recipe calls for 1 cup, but Alton doesn’t measure the juice in the episode. 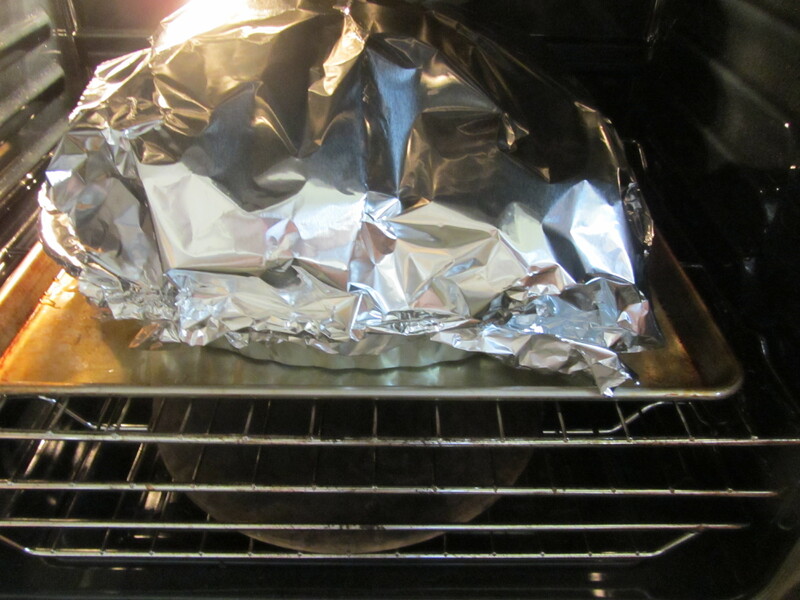 Tent the ham with a large piece of foil (two pieces crimped together), and place the ham in a 400-degree oven for 30 minutes. After 30 minutes, decrease the oven temperature to 325 degrees for 1.5 hours. When the 1.5 hours are up, pull the ham out and flip it over. 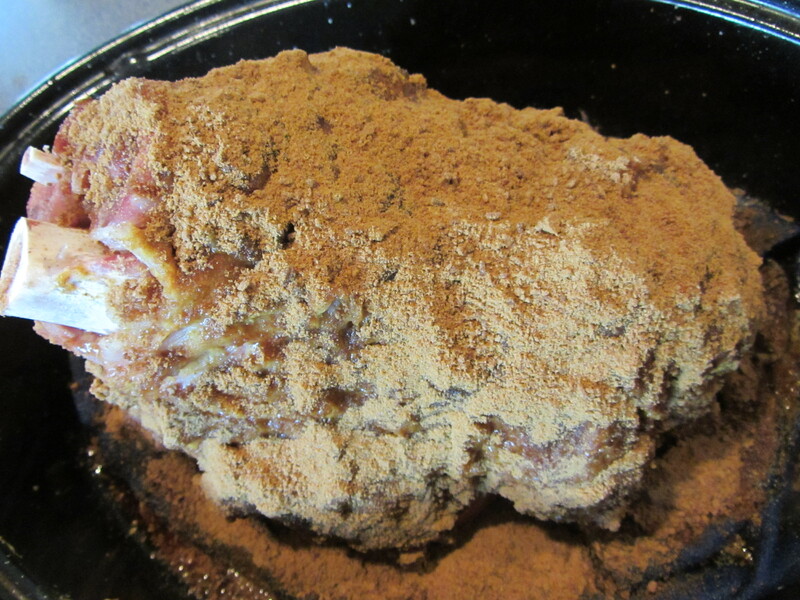 Ham pulled out after cooking for 2 hours. Flipped over in the liquid. 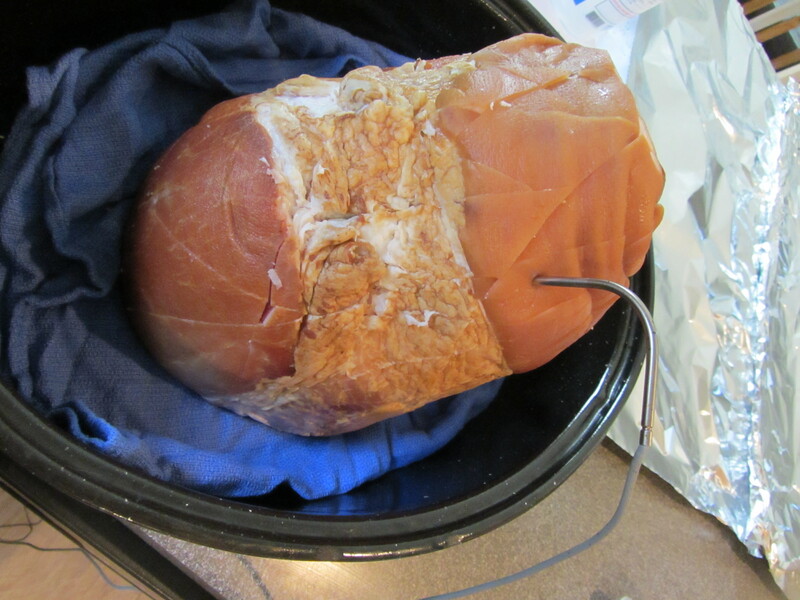 Cover the ham again with the foil, insert a probe thermometer, and wait for the ham to reach 140 degrees. 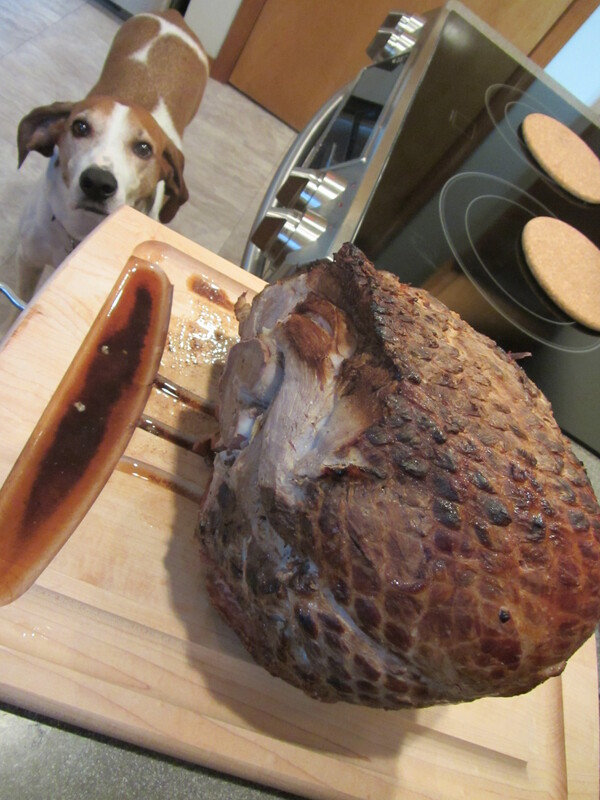 My 15-pound ham took about 5 hours to cook. Let the ham rest for a half hour before slicing with an electric knife. Ham after reaching 140 degrees. 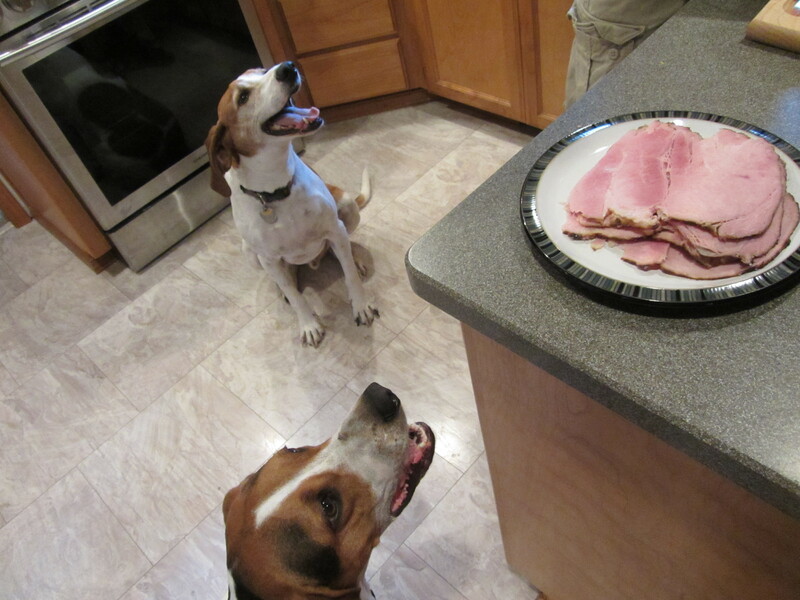 Hounds go nuts for ham. 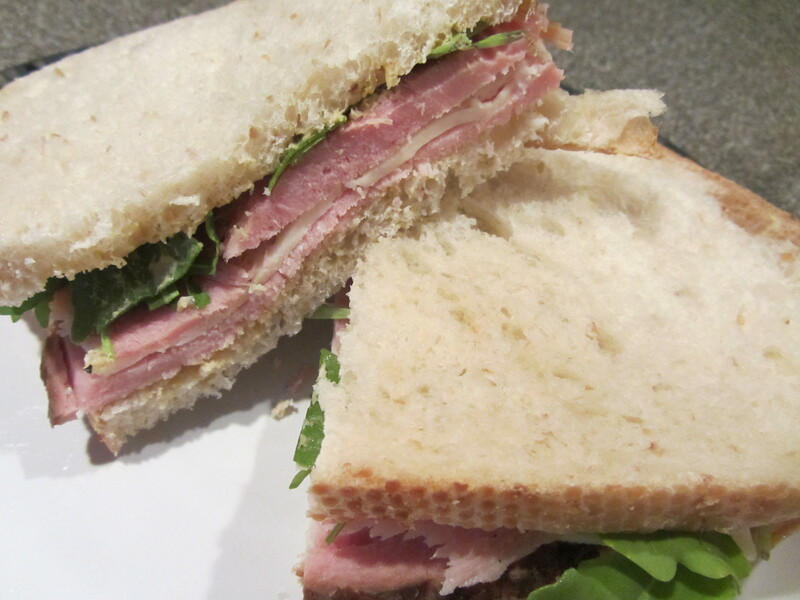 The day I cooked the ham, we opted to have ham sandwiches for dinner. The ham was fairly moist and tender. I think it would have been considerably drier in texture if I had used a true country ham. Though the ham had a faint sweetness to it, I would never have guessed that it cooked in Dr. Pepper and sweet pickle juice. My smoked ham was slightly salty before cooking, but I would be curious to see how a super salty country ham would turn out with this preparation. Regardless, this ham was super easy to cook and turned out flawlessly. 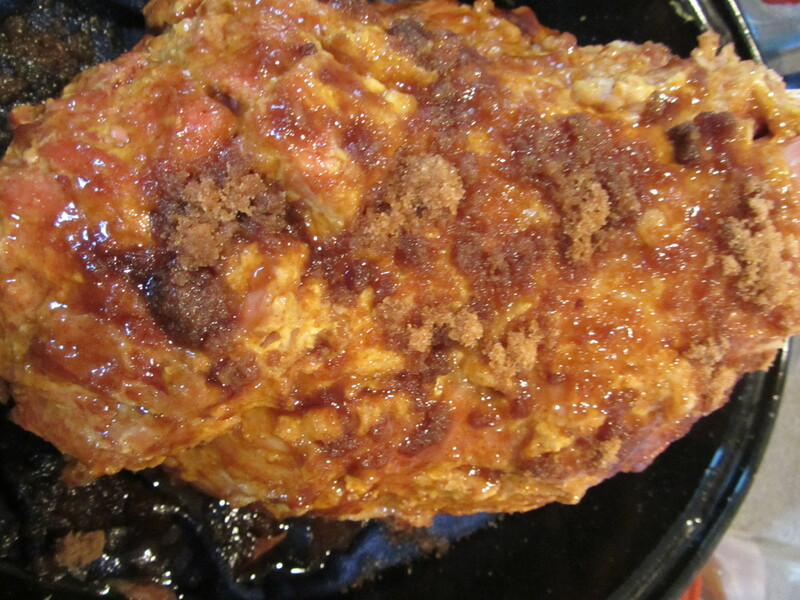 It was definitely “good eats.” This would be a super easy way to cook a nice holiday meal. After slicing all of the ham, we vacuum sealed it and froze it for later eating. 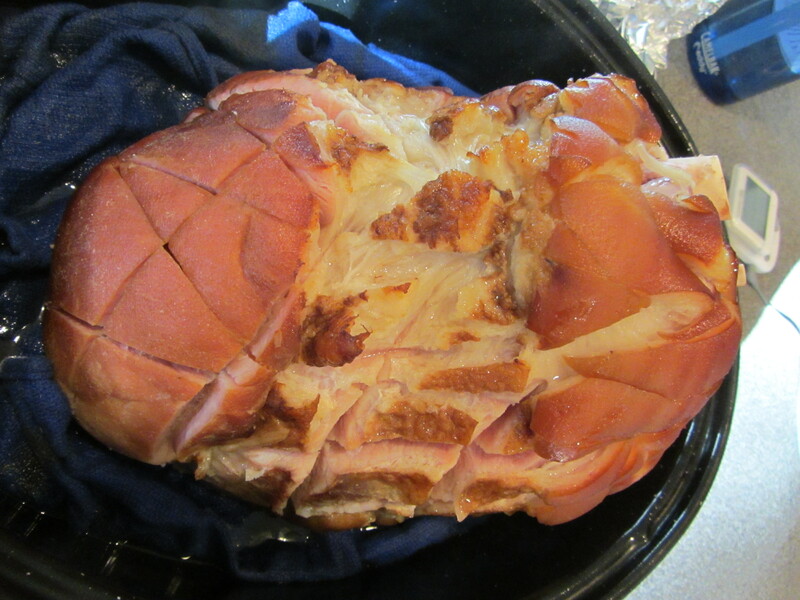 A couple of weeks after making the country ham, it was time to make Alton’s city ham. 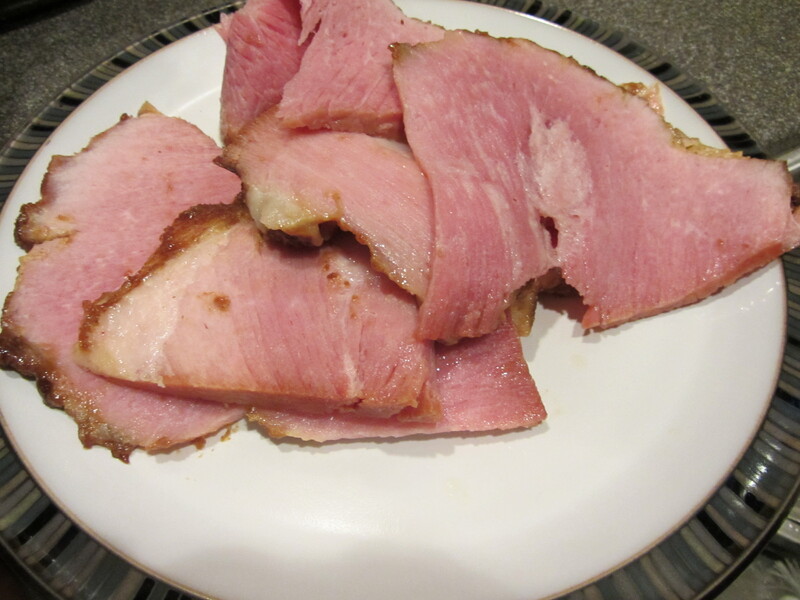 A city ham is partially cured in a brine and cooked to at least 137 degrees. Most hams that you see in the grocery store are city hams. 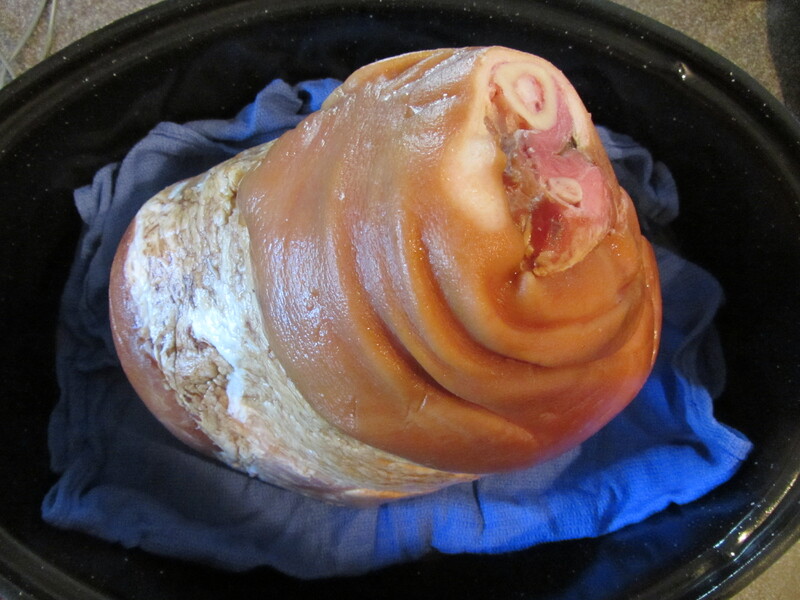 When buying a city ham, choose a bone-in ham that is the shank end, rather than the rump end. Ideally, you also want to choose a ham that says it is in “natural juices,” rather than saying it has “water added.” I purchased an 11 pound ham. 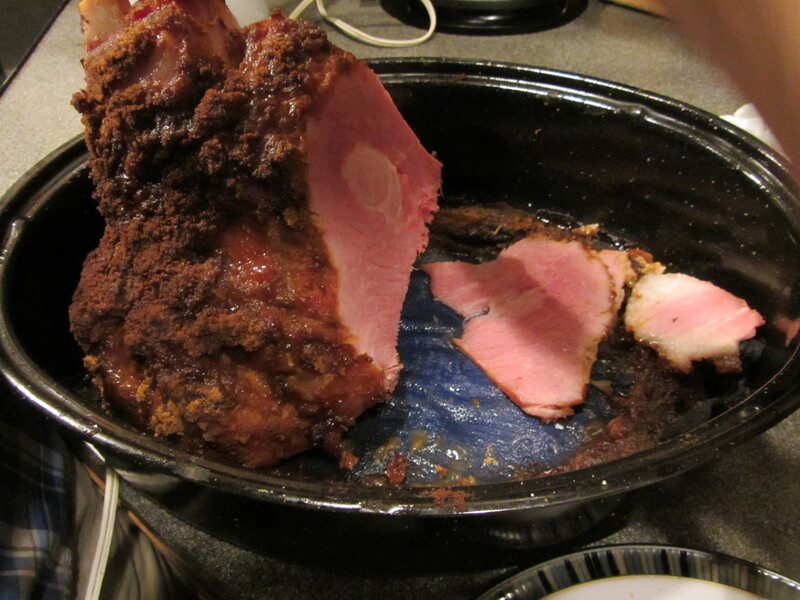 When ready to cook your ham, line a roasting pan with an old kitchen towel, and place your ham on top, cut side down. My city ham, on an old towel in the roasting pan. 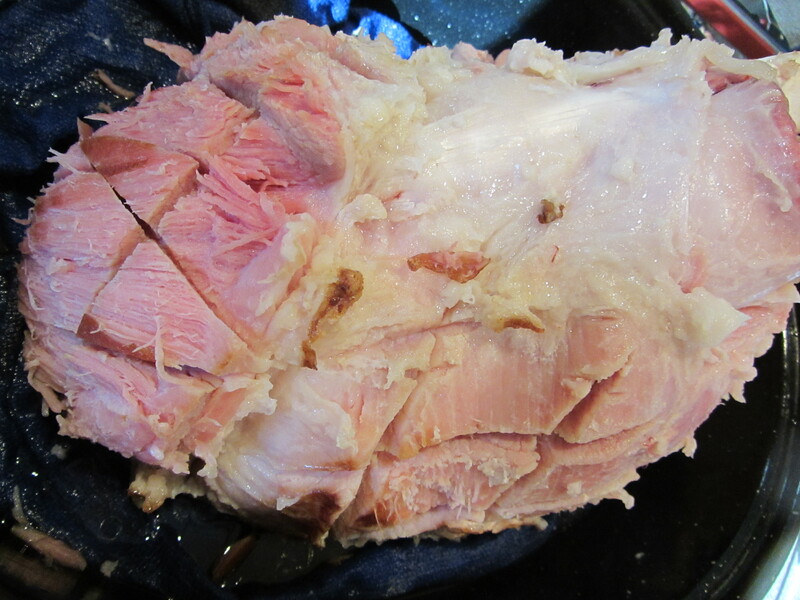 Using a utility knife on the 2nd click, score the ham diagonally from the bottom to the top, all the way around. Then, turning the ham in the opposite direction, score the ham again, forming a diamond pattern all over the outside of the ham. 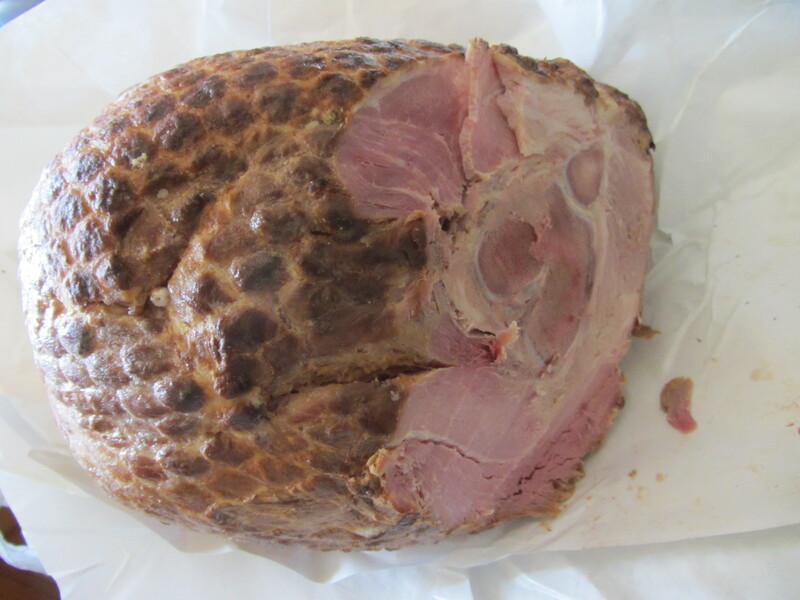 Ham skin scored in a diamond pattern, and probe thermometer inserted. 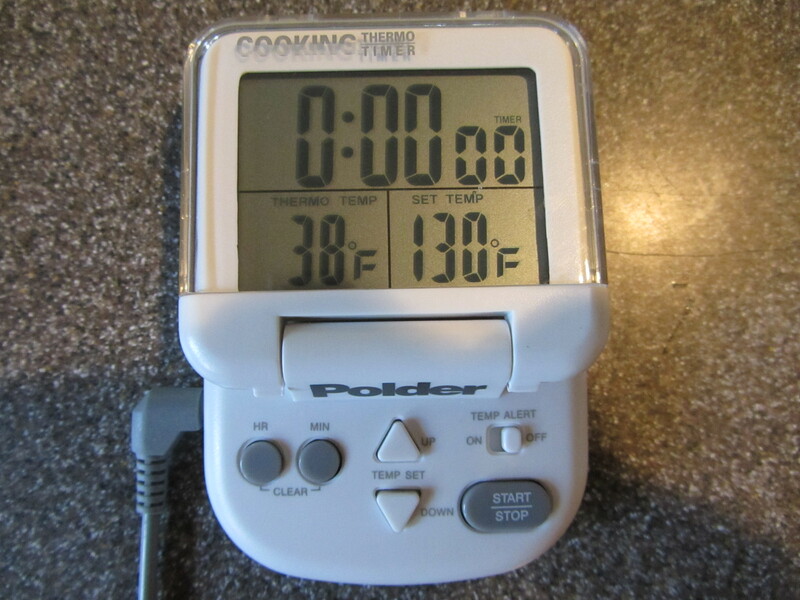 Insert a probe thermometer, tent the ham with foil, and cook the ham at 250 degrees until the thermometer reaches 130 degrees. My ham took 3.5 hours to reach 130 degrees. Starting temperature of 38 degrees, and goal temperature of 130 degrees. Pull the pan from the oven and use tongs to pull the diamonds of skin off of the outside of the ham. I had to use a paring knife to cut some of the skin off. Ham after cooking to 130 degrees. Ham after pulling diamonds of skin off. 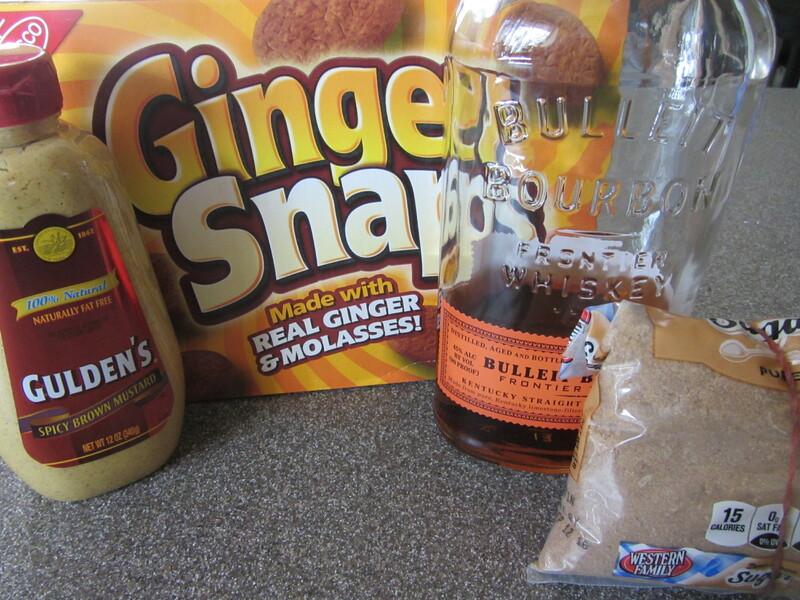 Ingredients for Alton’s ham crust: mustard, gingersnaps, bourbon, and dark brown sugar. 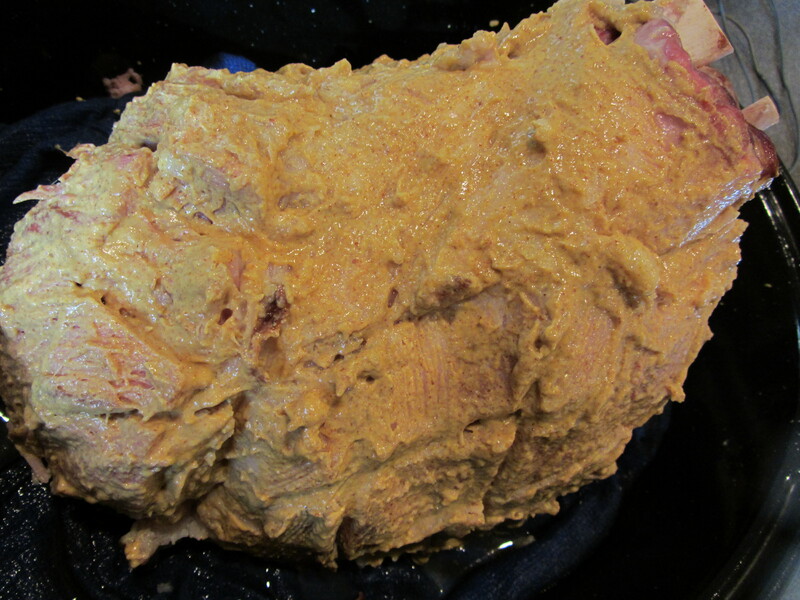 Once the skin is all removed, paint a generous layer of mustard (Alton used Gulden’s in the episode) all over the ham. Mustard brushed all over ham. 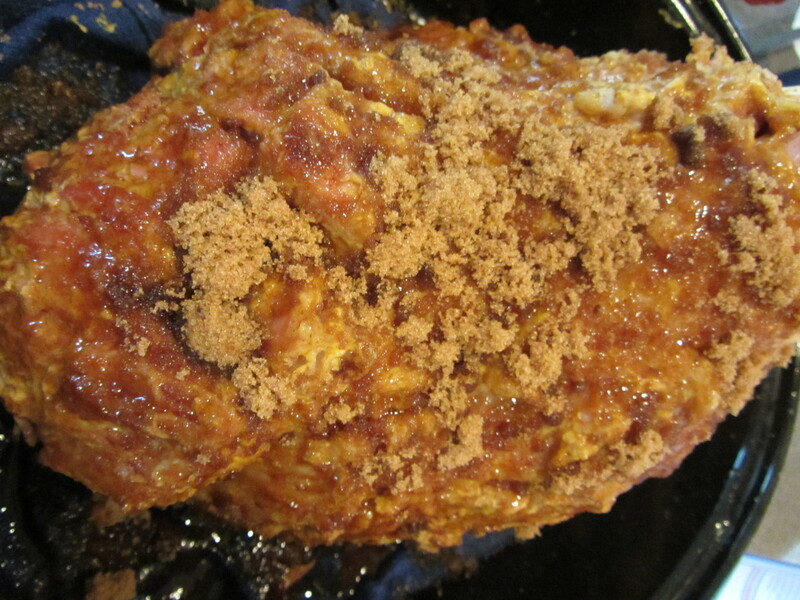 Next, sprinkle/pat dark brown sugar on top of the mustard. Brown sugar sprinkled on mustard. Spritz the ham all over with some bourbon, and finally sprinkle a thick layer of pulverized gingersnap cookies on top of the bourbon. Topped with a spritz of bourbon. A thick crust of pulverized gingersnaps. Stick the ham, uncovered, back in the oven (now at 350 degrees), and wait for the probe thermometer to reach 140 degrees. 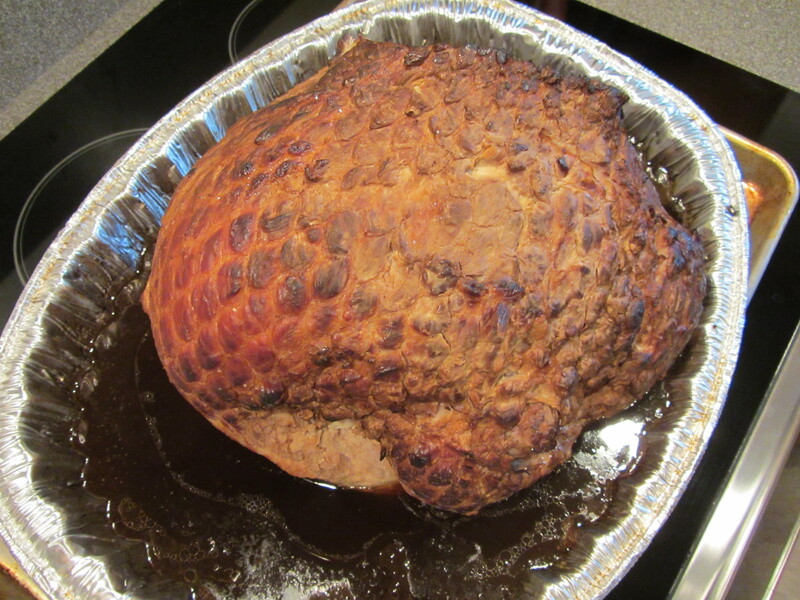 My ham’s temperature had risen to 140 degrees while I made the coating, so I opted to just put the ham back in the oven for an hour, as Alton had said his ham took about an hour. Let your ham rest for about a half hour before slicing with an electric knife. Ham cooked to 140 degrees, rested, and ready to slice. We had my parents over for dinner when I made the ham, serving it sliced, and with asparagus and sourdough bread. We also had a wonderful 2004 Woodward Canyon Cabernet with our ham. Everyone thought this ham was just amazing. While we liked the country ham, we thought Alton’s city ham was phenomenal. The ham was moist and perfectly cooked, and the crust was a perfect combination of sweetness and tang. I will absolutely make this ham again. This one is a sure winner. Don’t miss this one!